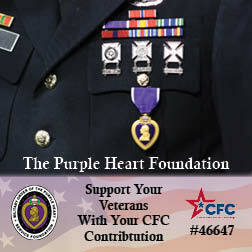 Purple Heart funds programs and provides support to our nation's veterans and their families from all wars. On May 26th, 2011, Army Captain Gregory Galeazzi was seriously wounded while conducting a dismounted patrol in the Kandahar Province of Afghanistan. Captain Galeazzi received severe injuries to his legs from the blast, requiring above the knee amputations on both limbs, and his right arm was critically damaged. Galeazzi was relocated to Brooke Army Medical Center in San Antonio, TX, where he received long-term medical treatment for his injuries. Captain Galeazzi is a Purple Heart recipient and was awarded the Purple Heart medal before leaving Afghanistan. His company commander paid for his life membership with the Military Order of the Purple Heart. After long months of recovery, with multiple surgeries and rehabilitation, Galeazzi began taking night classes with the goal of entering medical school. Galeazzi was accepted into five medical schools and chose to attend Harvard Medical School in Boston, MA. Although the VA would pay for his tuition, Galeazzi still needed assistance with out-of-pocket expenses. The Military Order of the Purple Heart Service Foundation was honored to help Captain Galeazzi by providing him with a $4,500 scholarship to assist with school and living expenses. Greg Galeazzi's story is one of the many stories which demonstrate how your donation significantly impacts the lives of our nation's heroes and their families. Donate to thank a veteran! For 60yrs the Purple Heart Foundation has funded grants, scholarships & outreach programs to help veterans get the benefits they've earned & deserve. In 2017, we helped 18K+ veterans get $2 Million in VA benefits. Our mission is to holistically enhance the quality of life of veterans & their families, and with your help we can continue to do that! Donate to help us honor their sacrifice with our service.